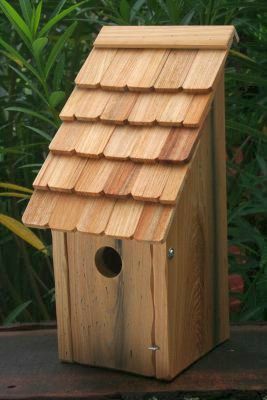 Round up a pleasing posse of America's favorite songbirds with this classic Bluebird Bunkhouse, beautifully simple in design and ruggedly built with front opening for easy cleaning. Truly American (they range only on the American continent), bluebirds suffered a decline in the last century after the introduction of European starlings and house sparrows, larger competitors that steal bluebird nest holes. Thanks to bluebird trails and other efforts, bluebirds have made a comeback; if you'd like to be sure to prevent any rustling on your range, simply place two Bunkhouses back to back or near each other. What you'll hear from your musical herds will be harmonious beyond compare! 1 1/2" hole.